Speed Reading Software Best Reader. Obstacles in a way to speed reading. What prevents us from reading quickly? Speed reading is a very useful skill, but there are some obstacles that stand in the way of speed reading. Did you know that most people read slowly only because of habit? A child who is just beginning to learn to read examines each letter, reads each syllable, pronounces each word, follows along a line with his finger, skips back and forth, and ultimately becomes a slow reader for the rest of his life. 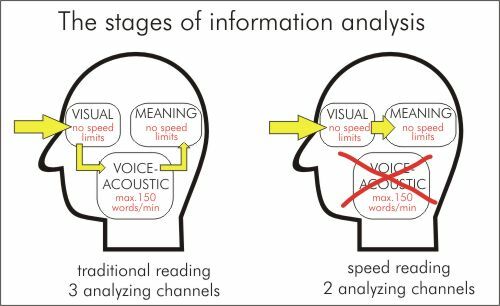 To master the method of speed reading, it is very important to realize the reasons for slow traditional reading and to understand its nature. The speed of reading for the majority of people who use a traditional method of reading does not exceed 750 characters per minute. 2. Narrow field of sight. Movements of the lips and tongue while reading to oneself are stopped only externally. In reality, they are constantly in latent (i.e. invisible) movement. The intensity of these micromovements first of all depends on the level of development of reading skills and the complexity of the text. The less developed ones reading skills are and the more difficult the text is, the more noticeable the articulation and internal speech. A habit of pronouncing words is common among the majority of readers. This habit is formed in childhood while learning to read. First, a child pronounces a word letter by letter, then by syllables and, at last, reads aloud a whole word. As a result of this, a strong reflex connection develops between visible and pronounced words. Ultimately, a stable and consistent habit of pronouncing the text is formed. Text is read not only with the eyes, but also with the "ears and lips". Since information is transferred into the brain and processed there with the participation of the voice-acoustic channel, the transfer rate is many times slower than visual transfer alone. The top speed of the voice-acoustic channel is about 150 words (or 900 characters) per minute. If you exclude this channel from the analysis chain, your reading speed will increase well. Best Reader will help you to get rid of articulation. One of the ways to overcome the articulation is a forced increase in reading speed. When the reading speed exceed your voice-acoustic channel capacity, you will not be able to articulate all words you read and your voice-acoustic channel will be disabled. You will notice that you can read faster and fetch out a meaning of a text. Field of sight is the part of the text (quantity of characters) precisely perceived by the eyes in one moment of sight. In traditional reading, when a few letters, or at best, two to three words are perceived, the field of sight is not wide enough. Therefore, the eyes make many excessive jumps and stops. When you have a wider field of sight, more letters and words are simultaneously perceived at every stop of the eye. This results in fewer stops on a page, and therefore the rate of reading increases. A man whose field of sight covers a whole line of text at once allows his eyes to glide over the page from top to bottom with practically no horizontal movements across the page. The unproductive transition of the eyes from the end of each completed line to the beginning of the next one greatly reduces reading speed. The many lines on a page inevitably result in numerous unnecessary transitions, i.e. repeated idle movements of the eyes. Not only is this a waste of time, but our energy is also wasted this way. The method of speed reading that this new program teaches will cause the movement of the eyes to be more economical and will cause the eyes to move vertically along the center of the page from the top to the bottom. Best Reader program of exercises includes reading the Schulte tables. This exercise will train your eyes and widen your field of sight. In slow reading, there are involuntary back-skipping movements of the eyes and repeated reading of the same text. Usually a person reading the text has to make from 10 to 15 back-skipping motions for every 100 words. Without realizing it, some people read every section of text twice - both easy, and difficult, - just to make sure they have comprehended the text. It is clear that repeated review of each portion of text noticeably reduces the speed of reading. The reading speed of the majority of people is much lower than what they could have without reducing their comprehension. The attention of a slow reader is frequently switched to extraneous thoughts and subjects and the interest in the text is reduced. Therefore, large fragments sometimes are read mechanically and the meaning of what was read does not reach consciousness. Such a reader, noticing that he is thinking of extraneous things, is compelled to re-read a fragment anew. When we take a book, often we can not define at once how much we truly need or want it. Whether the book is worthy of reading in its entirety, or whether it is even necessary to buy it, is unresolved. - Look over the table of contents, the bibliography (if there is one), and the summary of the book or article. - Estimate whether the material is new and contemporary, classic and timeless, or whether it has practical value for you. Experiments conducted by psychologists who have studied the technological problems of reading have shown that these recommendations enable a person to reduce the time spent reading a book. These recommendations can also almost double the comprehension and mastery of the text. Overcome bad reading habits now! New version of Best Reader is available! All registered Best Reader users can upgrade Best Reader to latest version for free.